"Adding ePub to iPad via iTunes no longer works post iOS-9 update – Hi Everyone. 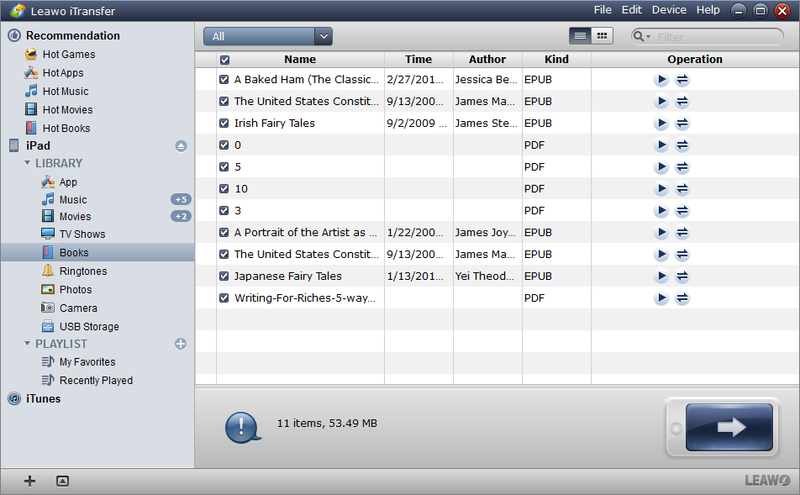 I have a large number of ePub files I want to add to my iPad to read through iBooks. Before iOS9, I just added them to iBooks on my mac, then opened iTunes and synced them across – always worked well. Now, if I follow the same process, it doesn’t work. If I open iBooks on my iPad as the sync is occurring, the book front cover will appear with a blue progress bar. Once the progress bar is full (i.e. the book is now on my iPad), the book cover disappears and the file isn’t there. So, I can no longer transfer ePub or PDF files from my mac to my iPad (yes, I know I can do it via email, but that is quite labor intense and makes it harder to manage). I’ve downloaded the latest version of iTunes and iBooks for my Mac, turned everything off and on, etc. etc. I have about 600 ePub files on my iPad, so a solution that doesn’t require me to delete my library would be great! Thanks!" By craig1014 from Apple Support Communities. 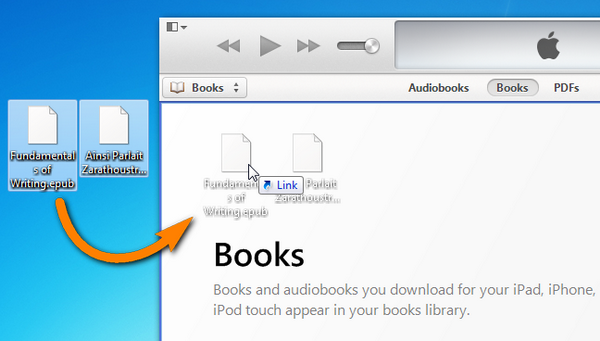 We all know that iBooks accepts ePub and PDF books. 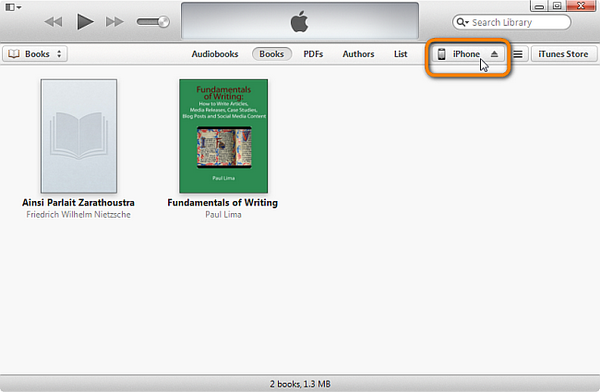 To read books on iPad with iBooks, you need to transfer ePub to iPad firstly. However, sometimes we may fail to add ePub t iPad due to various weird issues. If you happen to finding yourself being stuck in ePub to iPad iBooks transferring, this post would be of great help to you. 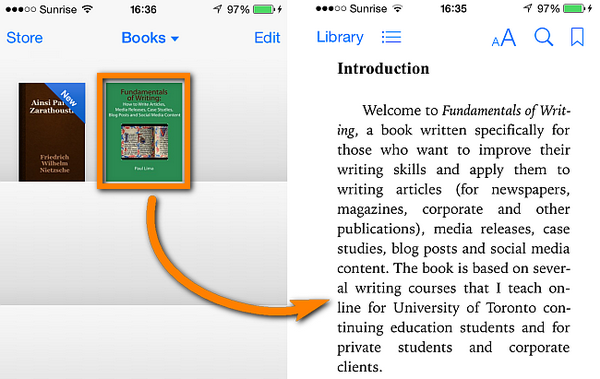 We would provide methods on how to transfer ePub to iPad tablets with detailed gudiance. 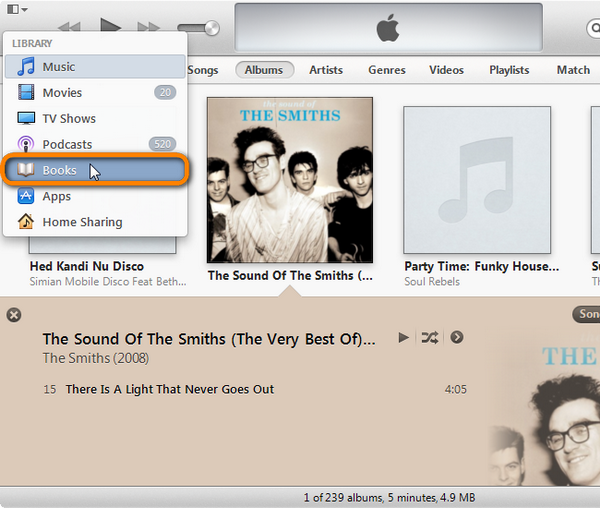 Open iTunes and then navigate to the "Books" tab. Ensure that the "Sync Books" and "Selected books" options are checked. Now click the check-boxes next to the ePUB books you wish to transfer to the iPad and click "Apply". First of all, open up your email client on your computer. 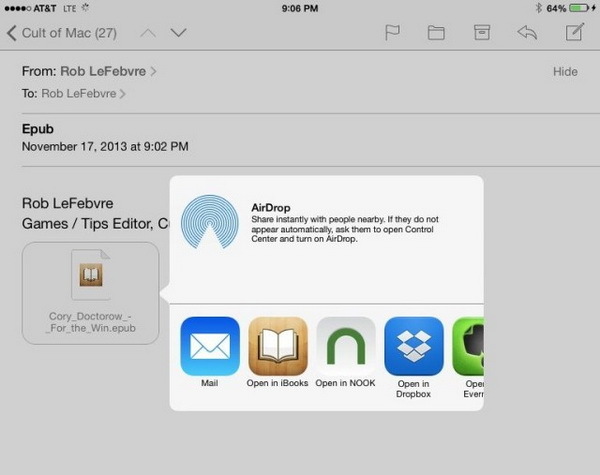 Address an email to yourself, and attach the epub file you want to open on your iPad or iPhone. Send yourself the attachment, and then go grab your iOS device. Open your preferred email program on your iPad or iPhone, and open up the email you just sent yourself. Tap the attachment icon to download it to your device, and you’ll see the icon turn into an iBooks one. Tap and hold on the file and an "Open in iBooks" will pop up. Tap that, and your iPad or iPhone will open iBooks and then open the epub file you just sent. 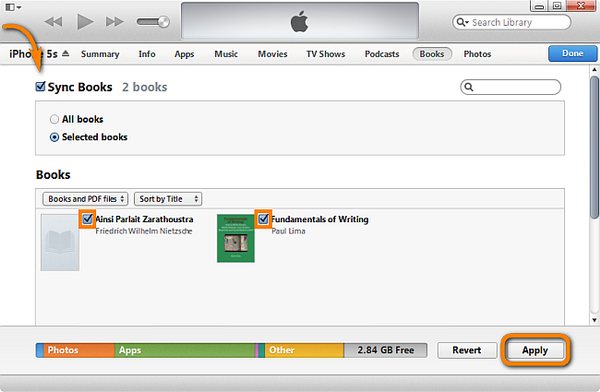 iTunes would delete the books you’ve saved on your iPad if you choose to transfer ePub books to iPad via iTunes. And it would take you much long time to transfer ePub to iPad via email since you need to upload and download ePub books, and then open them one by one in iBooks mode. Is there any way to transfer ePub books to iPad without deleting the existing books and in batches? Of course, you could take use of Leawo iTransfer, a professional iOS data transfer program that could transfer up to 14 types of data and files between iOS devices (iPad, iPhone, iPod), iTunes and computer, including ePub books. The below step-by-step guide would show you how to transfer ePub books to iPad from computer with Leawo iTransfer. Connect iPad with the computer via USB cable and launch Leawo iTransfer on your computer. This iPad transfer app would detect your iPad immediately and display it on the left. 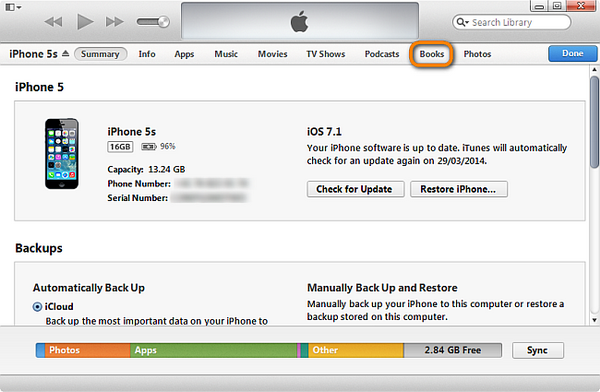 Navigate to the "Books" tab on your iPad from iTransfer by clicking "iPad > Library > Books". On the Books panel, click "File > Add > Add File/Add Folder" at the upper right corner of the window, and select the ePub file(s) from computer.By adding ePub books to iPad from iTransfer, Leawo iTransfer would immediately start to transfer ePub to iPad. You then could see a processing bar. With Leawo iTransfer, you could transfer multiple data and files like music, video, photos, etc. between iOS devices, iTunes and computer. If you’re using a Mac computer, you could make use of Leawo iTransfer for Mac.